Chassisworks offers A-arm crossmembers and front-frame clips, designed with the durability and versatility to fit your next pro-touring, g-Machine, muscle car, or pro-street project. 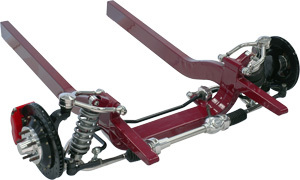 The 4x2", .120"-wall crossmember and front-frame clips can be sized to accommodate hub widths from 51 to 65 inches, in 1-inch increments, without affecting wheel rates, ride quality, steering effort, or turning radius. All front-frame clips feature mandrel-bent frame rails and crossmember, and come complete with all suspension and steering-system mounts. Frame clips can be shipped factory-welded or as unassembled kits for lower freight costs. Running Board Drops - 18" x 6"